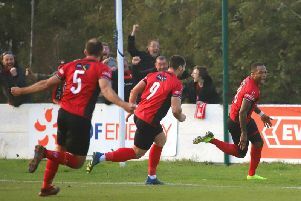 Not for the first time, the experienced striker was in the right place at the right time as he fired home a dramatic stoppage-time goal to give the Poppies a 1-0 success in Suffolk. With second-placed Stourbridge being held to a 1-1 draw by St Ives Town, the win sent Kettering 13 points clear at the top of the Evo-Stik League South Premier Division Central. They will now have the chance to wrap the title up in front of their own fans if they can beat play-off contenders Alvechurch at Latimer Park this weekend. O’Connor was back in contention after serving a three-match ban but he wasn’t sure whether he would be part of the starting line-up until Marcus Kelly was ruled out with a thigh injury. “To be honest, I didn’t expect to play,” the striker said. “I was there watching the game against St Neots and we won 2-0 and everyone played well so I didn’t expect to walk straight back in. “But with Marcus Kelly not being fit, it gave the manager a chance to mix it up and he decided to go the attacking route with me, Rhys (Hoenes) and Dan (Holman) all out there from the start. “Unfortunately, I don’t think any of us played too well from an attacking point of view. Things seemed to break down in the final third. “A couple of chances fell to me but I always felt confident that if something fell to me that I could finish it off. 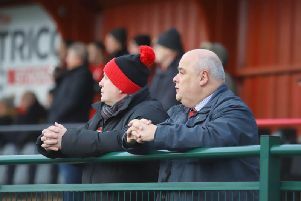 Boss Marcus Law revealed he and his staff passed the news of Stourbridge’s stalemate onto the players while the Poppies were still drawing 0-0 at the weekend in a bid to give them a final push in stoppage-time. And O’Connor believes that news gave him and his team-mates a bit of extra licence to throw bodies forward in the final moments. It eventually paid off with the winner coming in the fourth minute of injury-time. And O’Connor added: “We were being realistic about it in terms of how we expected the results to go. “Of course, we’re going to look at it and I think we had all thought that it might be the Halesowen game away from home or the one after that where we might get the chance to win it. “It’s not to take anything away from any other team but we thought Stourbridge would get the three points at the weekend. “But when they had drawn, the gaffer threw it out there at us and we knew that if we got a goal then it would give us the chance to win it at home, which would just be massive for everyone. “I wouldn’t say that hearing that news made us try any harder but it just gave us that chance to really go for it.